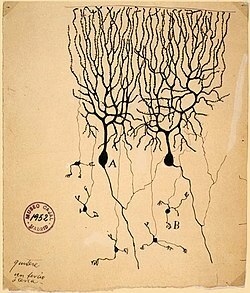 Drawin o neurones in the pigeon cerebellum, bi Spainyie neuroscientist Santiago Ramón y Cajal in 1899. (A) denotes Purkinje cells an (B) denotes granule cells, baith o which are multipolar. A neurone (an aa kent as a nerve cell) is an electrically excitable cell that processes an transmits information throu electrical an chemical signals. This page wis last eeditit on 17 Januar 2019, at 03:06.